It was the best of times. It was the worst of times. I turned 71 Sunday, which was probably a good decision, but I threw out my back earlier in the week, which definitely was not a good move. You never realize how much use you have for something until you throw it out. Just standing up is now a pain, and walking is even worse. As it happens, Morton McDonald, who has a home at Duck Cove in Inverness, had invited me to tell the Berkeley City Commons Club what I knew about Synanon from the cult’s days in West Marin. I had agreed to go last Friday but had to strut and fret my hour upon the stage from an overstuffed chair. It’s a long story. Former Point Reyes Light reporter Janine Warner and her husband Dave LaFontaine drove up from Los Angeles for my birthday and are staying for five days. My stepdaughter Kristeli, who is in her last year at New York University, will fly in Tuesday and stay for five days over Thanksgiving. Vegetation was hanging over the railing along the outdoor steps, and I wanted everyone to be safe when they used the stairs. When I cut four or five dead fronds off a palm and three dead branches off a couple of pines, the chainsaw went right through them. But when I bent over to cut some woody branches from dead sections of two daisy bushes, a muscle spasm locked onto my back with all four feet. Heating pads, back braces, and a ball-bearing-filled massage machine are helping, and I’ll no doubt recover in a week or two although post-traumatic-stress disorder could be a lingering problem. 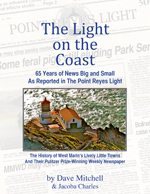 In the “best of times” category, The Light on the Coast: 65 Years of News Big and Small as Reported by The Point Reyes Light, which I wrote with Jacoba Charles as coauthor, is now in its third printing. The Tomales Regional History Center is the publisher, and the book can be ordered online using the History Center link in the righthand column. Two blacktails butting heads outside my kitchen window last week. I’d think a deer could easily get an eye poked out that way, but I’ve never seen a buck with an eye patch. Belated happy birthday! You’d think you’d be old enough to know not to bend over from your lower back with a chainsaw in your hand. Hope you’re healing up steadily and getting fussed over by friends and family! When you’re better, let’s aim for a meet-up at No Name Bar. Love to Lynn. I guess I’ve learned my lesson, Sarah. To mix a metaphor, having a backache is pain in the neck. Let’s set a date for the No Name. Happy Thanksgiving! Yes, Happy Belated Birthday, Dave! A friend of mine here in Berkeley heard your talk at the Berkeley Commons Club. Would have loved to have been there! He said it was quite interesting and enjoyed. Hope your back is better. So glad the book is doing well! and two blacktailed bucks were jousting � Sparsely Sage and Timely. And I actually do have 2 questions for you if it’s all right. Could it be only me or does it look as if like a few of these responses appear as if they are coming from brain dead people? Sparsely Sage and Timely is powered by	WordPress 4.9.10 and delivered to you in 0.420 seconds using 54 queries.